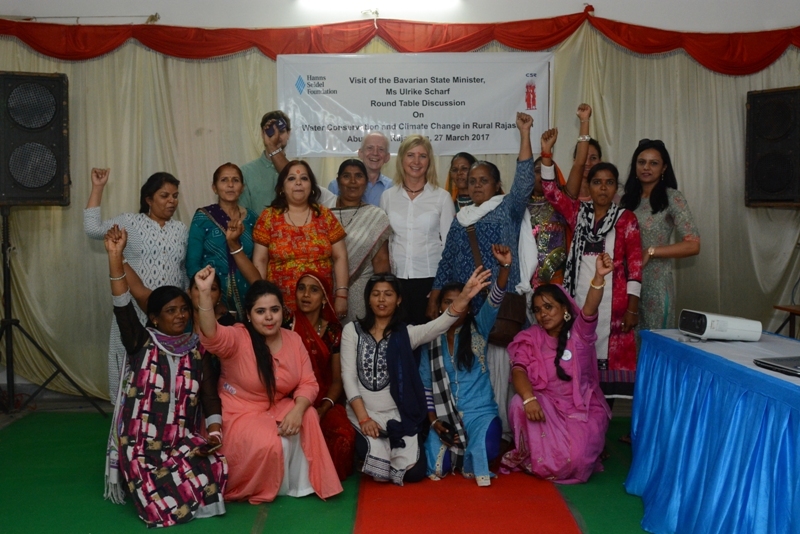 Centre for Social Research recognizes the importance of women’s active participation in governance structures and in management of natural resources, particularly given the increasing impact of climate change. (a) Increased understanding of connection between water issues and gender inequality. We began our 2017, with a field visit, which served as an opportunity for all concerned parties to make observations and learning about the area or place visited. It also helps the visitor to build understanding on the demography, culture and available facilities for the existing communities of the area. Minister of Environment & Consumer Protection of Free State of Bavaria, Federal Republic of Germany, Ms.Ulrike Scharf , attended the field visit, which took place on 27th March 2017, and consisted of CSR team members. This visit, held, along the climate project area in Abu Road helped the team to observe impacts of interventions made by the HSS-CSR Climate Project team at the community level with timely field support from local partner organisations i.e. – Jan Chetna Sansthan, SIDART and SARD. As the trainings conducted under this project involved capacity building of the EWR’s in acting as water conservation leaders, a visit to intervention sites helped in building a clear understanding on the existing water bodies available (such as well, step-well, water tank, pond, canal etc.) and the steps taken by the EWR’s in their conservation. Previous story Fight for Passage of Women’s Reservation Bill Gains Momentum!